To start, here’s a piece from Climate Central that exemplifies the new power of big data. Through taking information created all around us and applying thoughtful analysis, we can comprehend and unleash it to solve our greatest challenges. For EDF, that means partnering with the country’s top universities and most innovative companies to address the biggest challenge of our time – climate change. Today we launch the newest version of the Los Angeles Solar & Efficiency Report (LASER), a data-driven mapping tool that can help stakeholders and local leaders understand climate and pollution risks in their own communities. Empowered by this information, they can seek out and maximize available resources to deploy clean energy, reduce climate pollution, and create tens of thousands of much-needed jobs. Last March President Obama announced the launch of his Climate Data Initiative, which put a spotlight on the need and potential to use knowledge-driven insights to help communities effectively mitigate, prepare, and adapt to climate change. This was followed by the United Nation’s Big Data Climate Challenge in May. By releasing these maps today, we humbly join an international movement of individuals, public entities, and private companies who are maximizing the potential of shared information to inform, educate, and usher in a new wave of innovation and opportunity. Speaking of opportunity, although Los Angeles is famous for its nearly year-round sunshine, it is leaving about 98 percent of its rooftop solar potential untapped. Achieving just ten percent of that would drive the creation of 47,000 solar installation jobs and could reduce carbon pollution by nearly 2.5 million tons annually. This is the equivalent of taking more than half a million cars off the road every year. New, low-carbon energy options are critical to reduce greenhouse gases and avoid the worst impacts of climate change. 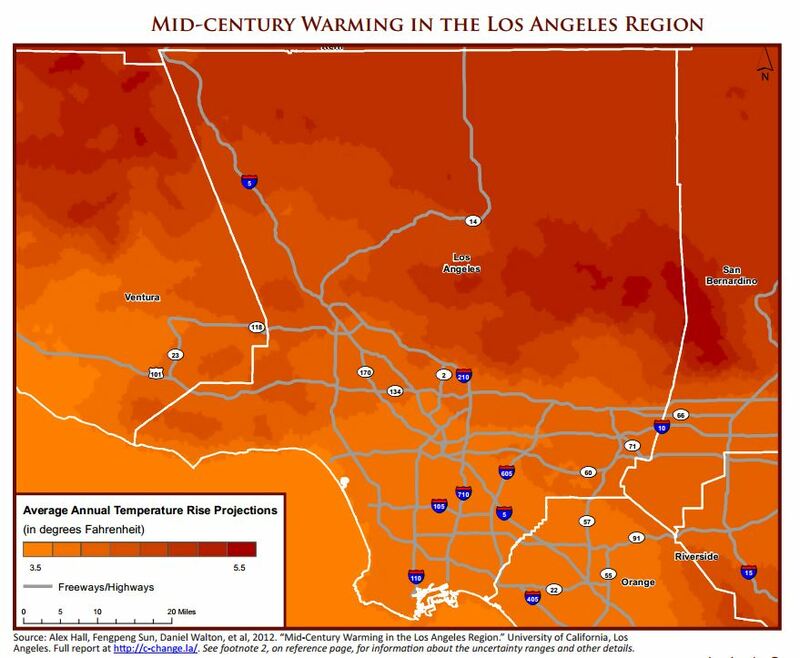 We’re already experiencing impacts of a changing climate, and Los Angeles County is projected to get REALLY HOT in the coming decades. Using groundbreaking climate projections by Dr. Alex Hall and the UCLA Department of Atmospheric Oceanic Sciences, the LASER maps show that, by mid-century, Los Angeles’ urban core and downtown will experience three times as many extreme heat days (above 95 degrees Fahrenheit) as today, and the valleys and areas of high elevation will experience four times as many. All air is not equal in L.A.
Half of California’s most vulnerable population lives in L.A. County, based on analysis from Environmental Protection Agency data and the CalEnviroScreen. That means there are 3.7 million people living in communities in L.A. County – 38 percent of the county –already over-burdened by harmful pollution and other risk factors that make them especially impacted by climate change. A majority of these vulnerable areas are home to low-income families and communities of color. As one of these maps demonstrates, there are polluting fossil fuel power plants right in the middle of many of these communities. There’s an overwhelming bright spot on the LASER maps. 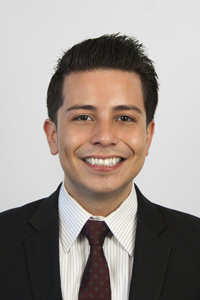 It turns out that some of the communities most vulnerable to air pollution and extreme heat impacts – like East Los Angeles, South Los Angeles, and the San Fernando Valley – also have some of the highest job creation potential through rooftop solar installation and energy efficiency, both of which also reduce climate and air pollution. Fortunately, California is already planning to prioritize clean energy and other low-carbon investments in the state’s most vulnerable communities via proceeds from its successful cap-and-trade program. Just last month, California Governor Brown allocated $225 million specifically to disadvantaged communities, above the mandated 25 percent of program proceeds. This set of visual tools can help overcome language, technical, and literacy barriers and bring all affected parties to the table to tackle difficult policy challenges. LASER maps serve as a valuable and empowering educational tool for communities facing increased risks as a direct result of climate change. Through increased understanding and openness, these maps can help create and advance a vision for a cleaner, healthier future for the region. Information is power. It’s not just for the data crunchers, the politicians, or even the climate nerds; it’s for everyone and can start a conversation that everyone can access. 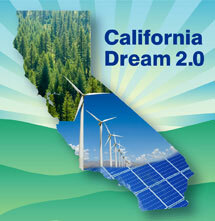 This entry was posted in Cap and trade, Clean Energy, Climate, Engaging Latinos, Jobs. Bookmark the permalink. Both comments and trackbacks are currently closed.